Well done to all the young people who took party in the ‘Great Telling Off’ at the 2018 Isle of Wight Literary Festival, especially the champions as voted for by the audiences. 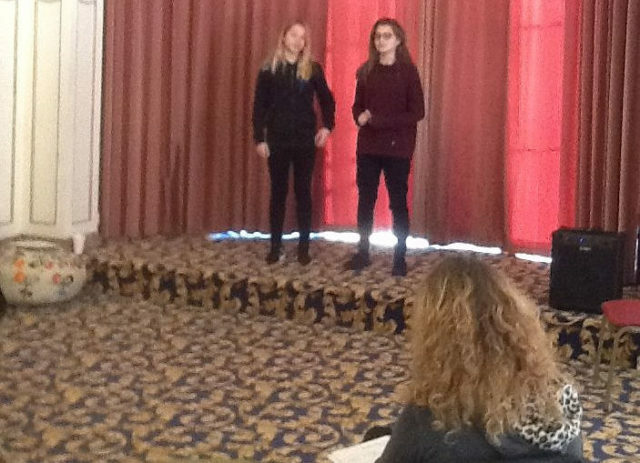 Imogen Mayhew from Arreton Primary School, and Daisy Chapman and Maxine Harfield from The Bay CE School are the 2018 Isle of Wight Literary Festival storytelling champions, as voted by the audiences of two storytelling finales called the ‘Great Telling Off’. Storyteller, Sue Bailey has been working with five primary schools (All Saints, Arreton, Broadlea, Hunnyhill,and St Saviour’s), and four secondary schools ( Cowes Enterprise College, The Bay CE School, The Island Free School and The Studio School) to help develop their narrative and storytelling skills. The brief to all was to create a story that must be told, not read, and last no longer than four minutes. For the secondary schools, the inspiration for the stories came from a visit to Bembridge Fort, on Culver Down. This Palmerston ‘folly’ played a significant role in the defence of the Portsmouth and Southampton during the second world war. National Trust volunteers, Melvin Hurst, Tim Wander and Bert showed the students around the fort explaining its history and role in Napoleonic times as well as in both World Wars. The winning story by Daisy and Maxine (pictured below) took the audience back in time as a ghost boy invited the audience to relive the horrors of the first word war. 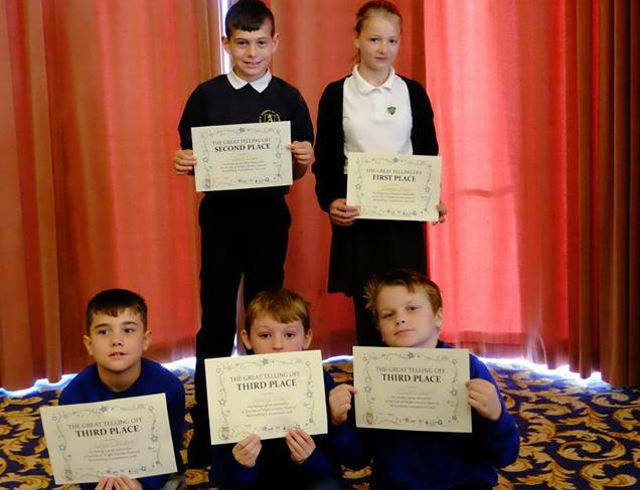 Second and third place went to two students from The Island Free School. Sam Smith’s story ‘The sad truth’ explored the inevitability of war across the ages, whilst third place Jack Perry’s story ‘Revenge’ told of finding an amulet as a link with the past. The primary schools enjoyed a visit from Owen Cambridge from the Time Taxi who brought three archaeological finds to inspire the children. These were an eighteenth century naval officer’s sword found on Ryde beach; a bronze age blade found in a fisherman’s net a few miles off the south of the Island; and a stone age mace head dredged up in Southampton docks. “It has been rewarding working with the students in all the schools.